Besides doing a bit of sight-seeing, of course, I had four full days to explore the Greater Helsinki transport system (11-15 June 2013 – 1 day taken off for a day trip to Tallinn – see separate blog entry). I already knew Helsinki from a visit in 2003 in preparation for my book 'Metros in Scandinavia'. At that time I focussed mostly on the metro, although I did ride the tram and suburban trains too, but now I had more time to see it all again. Not too much has changed since my first visit, lots of new trains are in service on the suburban lines, and the tram system has been expanded with short extensions mostly in the West Harbour area. Helsinki has a well-integrated fare system, which distinguishes between fares for Helsinki only (or any of the other adjoining cities) or a 'region ticket' for Greater Helsinki (or the Capital Region) which includes the cities of Vantaa in the north (where the airport is) and Espoo and the small town of Kauniainen in the west. A day ticket for Helsinki alone would be 8 EUR, and for the entire region 12 EUR. To be flexible enough, I bought a 5-day region ticket for 36 EUR. Yes, fares are higher than in Central Europe, but compared to other things, tickets are only slightly more expensive. On buses, those passes (sold as smartcards) need to be held against the card reader at each boarding, but on trams, metro and trains they just have to be shown to ticket inspectors. The metro does not have access barriers. People who use a smartcard as a cash card need to select the fare zone before touching in. Metro and tram run exclusively within the Helsinki boundaries, so the zonal system is only relevant for trains and regional buses (those with a 3-digit number, if I understood it correctly). Maps (a blue one for Helsinki and a green one for the region) can be picked up at several HSL information centres like inside Rautatientori metro station. The problem with the Helsinki hand-out map is that on one side it shows all bus lines on a city map, but NO tram lines, and on the other it shows only tram lines and NO buses, so changing from buses to trams and viceversa can become quite a tricky business if you're not familiar with the city (and I picked up the English/German edition certainly produced for visitors). Also, the geographical tram map shows stops, but no names for these stops, instead there is an additional diagram map with stop names. This map, however, does not show the destination which is actually displayed on the trams, as it mostly does not coincide with the name of the last stop (a thing I will never really understand! But this happens, unfortunately, in a lot of cities). The large tram maps posted at tram stops do include bus routes, too. All rather unsatisfying, and with a lot of room for improvement. I hope that the planned renumbering of tram lines 3B and 3T into lines 3 and 2 will take place during this summer as it is indeed confusing (at the railway station, both lines use the same stop!). I never got it right in my head, probably also because the T in 3T doesn't mean anything to me. And while on line 3 the distinction is between two halves of the circular route, on the othe circle line 7, the 7A and 7B denotes the direction of the route taken, clockwise or anti-clockwise. Generally the TRAM system is in a good shape, although it is a very classic system with a lot of street running, but many sections are marked off from the road lanes or have even been slightly raised or separated by a curb. Only a few outer sections are on a dedicated right-of-way lined by trees, most notably along Mäkelänkatu, the main entry road from the airport shared by lines 1 and 7. Line 1, however, is the odd line within the system, and does not operate after 19 hours or on weekends! And the unprefixed line 1 only operates during some off-peak hours terminating in the city centre, whereas at times line 1A is extended down to Eira. Some of the busier lines even run until 01:30. Riding trams is, however, rather slow, due to numerous traffic lights and no priority for trams. I always hate it when even left-turning cars are given priority although they have a separate lane. Most stops have next-tram indicators of various types, which is good as the timetable is not strictly followed... Line 4 appears to be the most frequent with trams about every 5 minutes serving the Katajanokka branches alternately most of the day. This morning, I observed that the 4T branch to the ferry terminal gets extremely busy with ferry passengers when a ship arrives and apparently HKL does not react to this regular influx by sending more trams, which could just shuttle between the terminal and the city centre, instead all trams run to Munkkiniemi. With the first of the new Transtech low-floor trams just rolled out for testing, the tram system is currently operated with two generations of vehicles, the older Valmet high-floor trams, a lot of which have meanwhile been retrofitted with a low-floor section, which doesn't really give them much more capacity but helps to speed up boarding especially for the large numbers of prams in this child-friendly country. It was certainly wise to extend the lives of this older stock as they are quite comfortable to ride. The newer Variotrams, which were already in service in 2003 but at that time rather scarce due to many teething problems, are now regularly seen especially on lines 3, 6 and 9, if my observation is right. I would say, they are o.k., although Variotrams anywhere aren't among my favourites, mostly the seats are not very comfortable, both the way they are placed on top of the wheelsets, and the upholstery they used, so all in all a tour on the older trams is more pleasant, but on hot days the Variotrams may be your choice due to the air-conditioning. Generally the tram provides a good service in the inner city, an area most tourists would not leave anyway, and as most lines are frequent and easy to understand, the trams are in fact frequently used by tourists. The METRO's function is quite different as it is only of very limited use for trips within the central area. Located between Stockholm and St. Petersburg, Helsinki also opted for a deep-level metro, in this case (unlike St. Petersburg) it was fairly easy to dig (or rather blast) through solid bedrock and thus avoid too much disruption on the surface. The negative consequence of such a decision is that passengers may find it too cumbersome to go down so deep just for a few stations and instead opt for the surface tram. On the other hand, the metro is a fast and reliable service to reach the eastern districts of the city. The trains ride very smooth, the track is well-laid, just the plastic seats are a bit hard. Overall I like the strong orange identity present in everything, a proper logo, large signs, etc. The stations are mostly o.k., but in the deep-cavern stations, a hung-in ceiling mostly doesn't let you appreciate the cavern as they would in Stockholm. Most of the surface stations look rather plain, although Siilitie has nicely been rebuilt a few years ago. The fill-in Kalasatama station is also very modest, and it looked quite dirty from the dust coming from the surrounding construction sites; it is still waiting to develop its full potential as many areas of the large port redevelopment are still underway or hardly started. Along with the metro's western extension, the existing line will be made driverless. 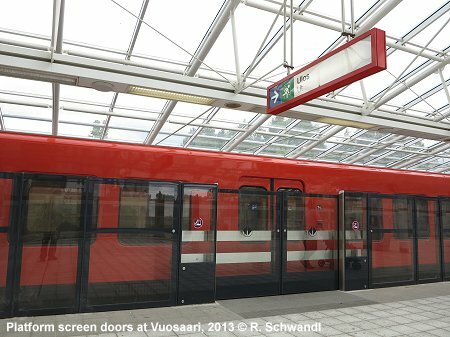 The only preparation for this that is visible are the platform screen doors installed for testing at the Vuosaari departure platform edge. They already calculated that travel times will actually increase slightly, probably because of the door opening and closing procedure. And they still have to educate users, as I observed one woman who even tried to force the doors with her pram. These people not only put themselves and their babies at risk, but are also responsible for the delays as a driverless system may be halted for quite a while until someone interferes manually at the control centre. Maybe people will be convinced that it is better to wait for the next train, as they are promised to be more frequent. Right now there is a train every 10 minutes on each of the eastern branches, this should be reduced to half the waiting time, resulting in a train every 2.5 min on the trunk section. In Espoo, the construction of the Länsimetro (West Metro) is clearly visible at many sites, but as this section is also blasted through bedrock, construction sites are only necessary at selected locations, for shafts and accesses. But as all sites are protected by metro-orange boards they can easily be spotted. It's actually a pity that also the section between Lauttasaari and Keilaniemi is deep underground, because a surface bridge alignment would have provided a nice view of the island hopping between Helsinki and Espoo. The service VR provides on the suburban lines is quite metro-like on some routes, with trains every 10 minutes stopping at all stations to Kerava, Vaantankoski and Leppävaara, where these trains have their own dedicated pair of tracks, and I think, no level crossings at all. Suburban trains that run further out and skip the inner stations, run on the mainline tracks shared by long-distance trains. The metro-like routes are now mostly exclusively served by new Stadler FLIRT trains, which have low-level access throughout, although with steps between carriages, but generally a very pleasant train. 1) the lack of a proper identity like S-Bahn, S-tog or Pendeltag, instead these trains are just listed as 'local traffic' (Lähijunat/Närtrafik - in English they actually use 'Commuter trains', a term I don't like at all except for real American commuter trains which only run inbound a few times in the mornings and back home again in the evening). So, I would hope they used some sort of trendy image for this excellent service, maybe even 'metro' and although it is still part of the VR network, it could form a unified metro system with the HKL Metro in the eyes of the passengers. With the completion of the airport ring line, it should even become more metro-like on the inner sections. 2) the excessive use of route identifying letters, almost as complex as the 4-letter codes on the Paris RER system, almost intransparent for the occasional user. But the current system obviously has a long tradition and may not easily be overthrown, but maybe some letters used for only a few services should be phased out for the sake of simplicity. I have not studied the different stopping pattern enough to make a suggestion, but I'm sure something could be done. I don't know whether the Vaantankoski line, which is quite metro-like and a new edition from 1975 was given the letter M for Martinlaakso (where it initially terminated) or to insinuate its metro character, as additionally it is also identified by the orange colour. Well, in fact it's older than the proper metro (1982). 3) A third point I would make on the negative side would be the long way you have to walk to actually catch one of the more frequent services. But as a solution is already in the making in the form of an underground loop that will even more create a proper metro line, I will only describe the current situation. A and M trains depart from some added platforms on the western side of the central railway station, but these are some 200 m further north than the older tracks, the same is true for the N etc. services to Kerava on the eastern side. So if you happen to be at the rear of one of these trains and you need to catch the tram or the metro, you easily have to walk 500+ metres, i.e. almost a typical inner-city metro interstation distance. The future loop will have a 'Keskus' (centre) station further south, actually to the south of the present metro station, and while interchange with trams should also get easier, most people will also be carried closer to their final destination in the city centre. 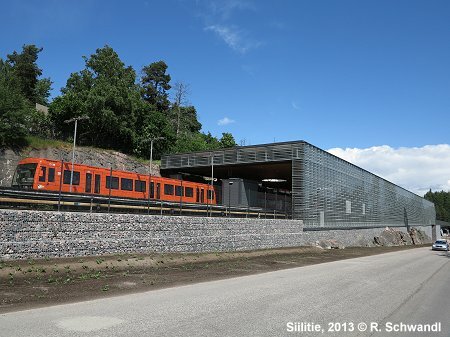 There will be two intermediate stations, one at Töölö, the other next to the metro station at Hakaniemi. As interchange with long-distances trains is available at Pasila anyway, it shouldn't be a problem that the central railway station will be a bit far from Keskus station. I don't know what the current plans are, but I assume that the airport line will operate as a proper ring (a sort of 8-shaped route) while the Leppävaara (or Espoo) and Kerava lines can form another through line. So, between Huopolahti and Tikkurila or Hiekkaharju there should then be a train every 5 minutes during most of the day. 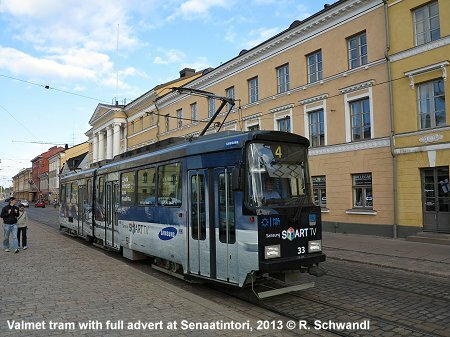 Outer suburban services are planned to continue terminating at Helsinki station. Robert's blog about his visit to Helsinki was interesting reading -- a few random comments from the sidelines. The Helsinki select-your-fare-zone-before-boarding system is annoying,since you need to use both hands to choose the zone and tap your card, and confusing for visitors, since the readers are usually only labeled with "0,1, 2, 3" (single tram fare, transfers allowed within Helsinki,Helsinki/Espoo/Vantaa, and outer regional respectively). The touch-on,touch-off system used pretty much everywhere else in the world would make a lot more sense. changed the routes a few years back. The craziest thing is that "T" doesn't even mean anything sensible and in fact nobody seems to know where it came from! The most likely theory I've heard is that they were originally 3A/B for clockwise/counterclockwise, like 7A/B, but 3A was renamed in 1951, one year before the Helsinki Olympics, to be a *T*ourist route that takes visitors on a loop around the city! Until the 90s, they even had little "tourist" signs on front and sightseeing brochures on board. minutes off peak for the branches. Using italics for Swedish would be sensible, but will never happen for political reasons since it implies that Swedish is somehow less important (shock horror!). But in Helsinki you can at least rely on Finnish always being on top and Swedish always being below... in the (few)Swedish-majority areas in Finland, this order is silently reversed! There's been talk about simplifying the current alphabet soup into a few geographical lines (one per current color) with local/express services, but I'm not sure this is going forward -- as you say, there's a long tradition to the current map. And yes, the Ring Line via the airport will be operated as a loop line. This was a very nice summary to read and I have to agree with most you say. Vantaankoski line was initially planned as a metro though I still don't know if this or Martinlaakso is the defining reason for the letter M. If I had to guess, it would be for Martinlaakso, as letter R denotes the line to Riihimäki and K to Kerava. However, many other letters have nothing to do with the destination so your guess is probably as good as mine. 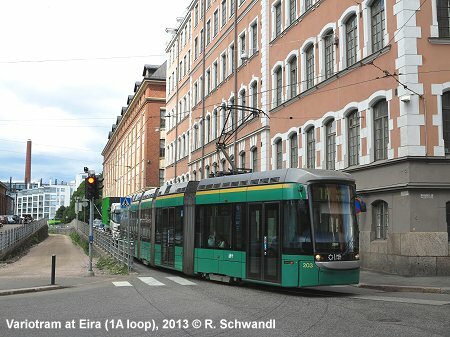 There are some people here (me included) in Helsinki trying to get the tram system modernized. If you decide to come to Helsinki again at some point later on, it would be great to go out for a coffee or a ride. With the opening of the ring rail line the M line is renamed I anti-clockwise and P clockwise. I had a discussion with HSL about this and they said they deliberately dropped M as a train route because of confusion with the metro. They said they would not want the same letter for trains in both directions around the ring because people would be confused although I don't really agree on that point. The yamanote line in Tokyo is circular and circle line in london was a circle (now not quite) and people look at the train destination to choose the right train. I live next to Käpylä, and I understand the underutilization of tram 1's route is due to noise complaints from what is likely a vocal minority. The same vocal minority probably keeps the city government at bay regarding other matters so there might not be that much challenge from other residents (the city is generally unenthusiastic about the area due to its long, narrow streets and old buildings and infrastructure; there was a big push in the 70s to tear down everything, ultimately defeated). I think Käpylä line suffers from the frequent bus service that comes from Oulunkylä and the other suburbs norther than the tram goes. 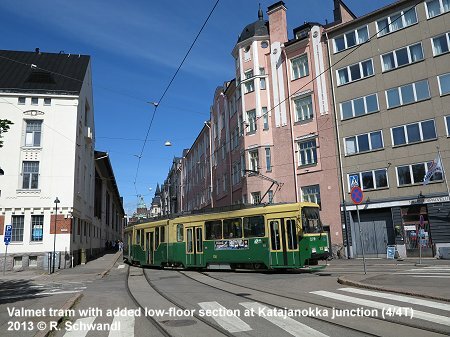 Also, the tram northern terminus is in old and sparsely built wooden Käpylä and southern terminus is in Kauppatori / Eira and it goes through Kallio, whereas buses go through "Kurvi", a major exchange point, and they terminate in immediate city center. The route is a bit of a relic, because it used to serve well the shipbuilders that went to Hietalahti shipyard, very near the southern terminus. This probably saved the line during the first round of cancellation in the 50s, when Kulosaari, Haaga and Pasila lost their service. Nowadays the line has been kept around because it has the best right of way from all the lines in the middle of Mäkelänkatu. 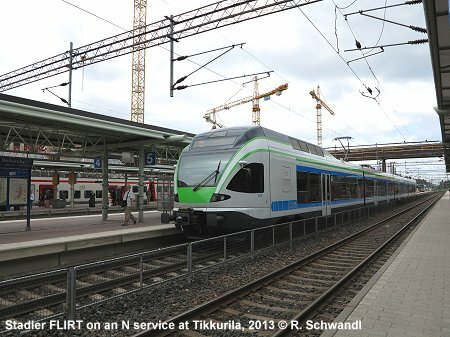 Also, it has been anticipated that a second transfer track would be laid from Koskela depot to meet the line's northern terminus, to improve redundancy and ease congestion in Kustaa Vvaasan Tie. Very little to do with noise, I afraid. Confusing fare zones and even more confusing maps; you are, unfortunately, absolutely correct. These are mostly a historical remnant of the old operating structure. Up until 2010 when HSL was fully established, the municipality of Helsinki independently planned transportation within itself, most recently under HKL. If I remember the history correctly, the surrounding municipalities were originally planned by their respective bus companies individually. At some point a regional body called YTV was formed to manage services such as water and public transport in the region, but even then HKL remained independent. Later a decision was made to combine the transportation section of YTV and the planning section of HKL into HSL, and now we're finally at a point where one regional agency is actually managing all public transport as a unified network. Some sensible decisions have already been made, such as unifying line numbering (for example, currently there are THREE bus lines numbered 43 in the different municipalities) and moving to a circular zone pattern that coincides better with actual transportation needs than municipal boundaries. Sadly, these are yet to be fully implemented, but I hope in maybe five or ten years' time the whole thing will look much better, including maps. Line 1 is a bit of a missed opportunity; it runs on some of the best tram tracks in the city. Sadly, there isn't much reason to use it since along the same street runs a bus every two minutes or so during daytime. There have been proposals to curtail most of those buses to a new terminal at Käpylä station from where you could take a fast train to the city centre or a tram to most other destinations, but they remain speculation. This is somewhat connected to the "Droplet" ("Pisara") railway loop, which probably isn't happening very soon. As for Lähijunat, the issue is that they really aren't a unified group of services at all. Decades ago they were perhaps a little closer to one. Some of them (mostly Y and Z) really are true commuter services with a very limited schedule and a distant end station – Lahti is a city 100 km from Helsinki! Some others (A, M, I/K/N) are more like metro with their dedicated tracks and frequent trains. Yet others (e.g. S) are an odd midpoint of the two. Part of it is just a turf war between VR and HSL – as a former state agency, VR is still running very much its "own" service everywhere in Finland. At the same time, HSL plans the service within its area and that includes many of the aforementioned train lines, so strictly speaking VR is only a contracted operator on many of the services it portrays as its own. (Tho as a monopoly that can name its price it effectively has a say in the planning as well.) The transfer distance at Helsinki "Hbf" is mostly caused by the physical arrangement of the tracks but it also very much marks a separation between VR and HSL. As a side effect, the railway lines aren't displayed very prominently on HSL's (really ex-HKL) maps, since "let VR keep their beloved trains; we have this fancy orange Metro we built ourselves!" Aaand I seem to be reaching the character limit. So really, many of the issues are simply caused by quarrels between organizations. And corruption and incompetence. Sigh. I agree with most of what you said about the public transit conditions. Very accurately put what's wrong in the HRT. Many peculiarities must exist because of the tradition of Swedish language in Finland and especially in the Capital Area. The thing about 3B and 3T stems probably from the destinations where the two tram routes are heading B = Berghäll (fi. Kallio), T = Tölö (fi. Töölö). The scheme was initiated in 1950 when HKL/HST was still pretty much a Swedish-speaking city utility. The equality of Finnish and Swedish has grounds on quite a few things. First of all, the Finnish Constitution states that Finland has two national languages: Finnish and Swedish. Secondly, the Language Act demands that any city is bilingual, when either a lingual minority is of at least 6 % _or_ 3'000 people. The whole Capital Area has over 60'000 Swedish speakers and on Finnish scale that's a whole lot of people - twice the number of all people living on autonomous Åland islands and about 1 % of the whole Finnish population! The Umgangssprache of Nylandian coast around the capital has always been Swedish up until the mid-20th century, when the mass migration from the inland to suburbs around Helsinki/Helsingfors made the stats go upside-down. It's pretty much the same as in the Brussels region where the lingua franca was switched from Dutch to bilingualism to French during the 20th century. I guess not many in the Belgian capital wonder why everything is even today like "Grand Place – Grote Markt". Thus even the toponymy of capital area is originally mostly Swedish (with a few notable exceptions such as Mäkkylä and Kivistö). In other words, the place names used today even in English and German are actually translations/bastardizations/tailored from Swedish to Finnish migrants! But in the last few years the old signs actually have been replaced with newer ones one by one with Swedish (and English) texts in italics and/or lighter font weight. This should improve the legibility for everyone. As for Finnish/Swedish, in my publications I treat them like Brussels, i.e. the maps show both names (although for clarity I always use French first in Brussels, not mixed as they officially do), and in the texts I first explain the situation and then use Finnish only, just like HSL uses Finnish names in the English texts, as in "The Ylioppilastalo tram stop (0401) is out of use." I think it is a good idea to label the more metro-like suburban train services with an M. HSL should assign the proper metro line the number M1 (plus M2 if they want), and then use M3 for the airport ring and possibly M4 for a Leppävaara - Kerava service via the city loop. And the rest of trains labelled with an R as you suggest. K and N (going to Kerava; K skips a few stations), and T to (via Tikkurila and Kerava) Riihimäki are the other lines that stop mostly on all stations but still go further out than a typical metro line would. This was indeed a nice summary. Vielen Dank. A more elaborate version of the following text is in my blog: Weird Letters and Two-Sided Maps – Public Transport Travel Information Needs User-Centered Redesign in Helsinki Region. The most actionable for me were the observations on bus and tram map usability and intransparencies or perceived arbitrariness of line naming information with local trains (letters) and some trams (3T vs. 3B; letters). Letters seem confusing without apparent meaning. In fact, even I as a Helsinki native, do not recall which one of the 3T and 3B and 7A and 7B go which direction. I choose the correct by selecting the appropriate stop. You memorize them after you use them, I suppose, but there is no other glue. What is your opinion on the airport ring line ("kehärata" in Finnish or ring rail line in English Wikipedia)? I assume you think it is good. The travel time would be reduced from current 42 min (bus) to about 30 min. But, on the other hand, it is quite expensive. I assume its main appeal is clarity and ease of use for new users. I think, however, that the bus lines could be designed more easier to use by making destination information, travel time, location information, etc. as clear as possible, with the help of necessary user centric design methods. The problem is that there are indeed projects... but they're hardly significant enough to actually make it worthwhile. The whole line is really more about better connecting parts of Vantaa to each other and the airport just happens to be on the way. As for the eastern metro expansion, there are plans to build an entirely new district for up to 70 000 residents in the land there. The metro extension is seen as a 'natural' part of it, even though many experts are saying light rail would allow for much better development locally and heavy rail (probably continuing eastwards to at least Porvoo) would be better for connections to the city centre. The whole project is more than a little controversial since it involved the municipality of Helsinki annexing land a few years ago from neighbouring Sipoo even though the popular opinion in both municipalities was against it. Many of the involved politicians refused to even vote on the final decision. Later on some of the land has even been deemed unsuitable for any construction since it's either too wet or protected in some way. In any case, the Helsinki region is projected to grow by 400 000 residents within a few decades, including immigration and new births, not only emptying the rest of the country. New districts somewhere in a forest might not be the best solution but it's definitely a very Finnish one. There are some level of plans for at least Östersundom (the recently annexed part of Helsinki), the Kivistö area in Vantaa and Hista in the far west of Espoo. We'll see what comes of them. Regarding Kivistö: the city of Vantaa is planning construction for about 20000 inhabitants in to the area served by the stations. Finland is several decades behind in the urbanization compared to the rest of the Europe and hence the amount of people moving to Helsinki still seems to be endless. That 20000, by the way, is merely a bit more than one year's population growth in Helsinki region. And we've been growing that fast for the past several decades. I have been in Helsinki about 2 years ago. And I find it very complicate to buy a tickets to the metro. There is no any cash-office on the station, only ticket-mashine with all information only in finnish. One man showed me which buttons to press to get a ticket. It was needed about 5 or 6 times to press. I just repeted it in my next routes without understanding what I'm doing. So the system is nonfrendly for a tourists. I feel I should mention that the word "Pendeltåg" isn't really an S-Bahn-like brand name - it literally just means "commuter trains" ("pendlare" meaning "commuter"). If anything, "närtrafik" is a more unique name for it, since in Standard Swedish that term tends to be used to denote paratransit. A very interesting set of observations and you are right to criticise the route numbering and maps. I live near helsinki and they have a lot to learn about making public transport easy for people to use (more so for visitors). The new ring rail line has just opened going from helsinki via the airport and back by another route. This has led to some renaming of routes and more alphabet soup, together with incorrect signing of trains at the stations themselves. On this map it's not clear what stations with the bubble around the route letters means. Some stations have the bubble and some don't. Kirkonummi on the left has YSUL in a bubble but Masala below it has exactly the same trains stopping but no bubble. The new ring rail is given two letters: P for clockwise and I for anti clockwise. Timetable displays online are a bit of a disaster since P and I trains are listed as "from: helsinki to: helsinki" which is not very helpful (it's assumed you know the route of the P or I trains). Once at the station, stations on the left branch of the ring rail have P trains are displayed as "Airport" although they don't terminate at the airport but will keep going clockwise through Tikkurila to Helsinki. This is a bit misleading if you're somewhere like Aviapolis, one stop before the airport and want to go to Tikkurila. You take the P train a few stops, but your train will be signposted "Airport" with nothing apart from the route letter to let you know it actually continues past the airport. I have not checked yet but probably trains on the right hand branch going anti-clockwise are labelled "airport" even though they don't terminate there either. Perhaps the logic is that anybody going from the right branch through the airport and continuing to the left branch is enough of a local to have learned the route letters. Visitors will just concern themselves with going to/from the airport. At the airport itself all trains are destination "Helsinki" although the clockwise route is quicker than the anti-clockwise route. I'm not sure how trains at the central station are labelled for the ringline. Perhaps clockwise and anti-clockwise are both labelled airport. This I suppose will share the load by sending tourists to the airport randomly in both directions since I doubt they will calculate that the anti-clockwise route is quicker. The new stations themselves though are wonders to the eye. Huge caverns with a massive island platform with tracks on either side and artistic lighting. They are extremely deep though, 45metres for the airport station. It's much quicker to take the lift than the numerous escalators that zig zag down to the track level. The platforms seem long enough for 12 coach trains although only 4 coach trains are currently used. It's not clear if there is any provision already for long distance platforms at the airport (such as empty space for possible extra future platforms). The Kamppi metro station in the centre of helsinki has unused space underneath for a possible north/south metro line and it has been discussed that north/south intercity trains would run in a tunnel directly under the airport instead of the jarvenpaa/tikkurila route they currently take. The airport station does have some ramps going to a lower level although these are closed off. With regards to the new ring line running through "empty" areas like Kivisto, this area is already under massive development with extra motorway junctions and large numbers of apartment blocks recently built. It's amazing to see the forest levelled and a suburb spring up. Currently Kivisto station is surrounded by empty space, with new wide two lane dual carriageways around it but not a single building nearby, but in perhaps 5 years will look more like leppavaara with offices and shopping mall adjacent to it.